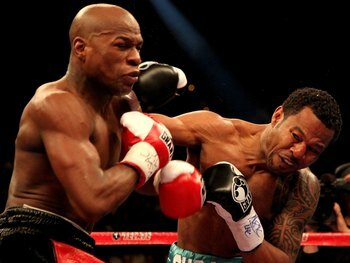 Floyd Mayweather is definitely someone I look up to and respect. People hate his ego, flashiness and big mouth. I admire his work ethic and dedication to his craft. After watching Money Mayweather outclass and out box Canelo who was given the infamous “blueprint” to beat Mayweather from Oscar De La Hoya (LOL!!) and Canelo was also considered his toughest competitor in years. Floyd made it look easy and left the MGM grand with another win to his name and another $41.5million in his bank account. 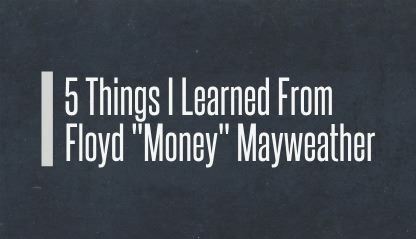 I don’t hate on successful people, I try my best to study and learn what I can from them, so here a few things you can learn from Floyd Mayweather. 1. Train Daily – Mayweather once said he trains every day, even when he’s on a day off he still does some light work, when he was in prison he was doing 1300 push-ups everyday to keep in shape, he takes every chance he gets to get better at his craft and improve his physique and skill. We should all do the same and read daily or write daily and forever be on a quest to improve our skills. 2. Never Underestimate The Competition – Floyd is the pound for pound best boxer in the world right now, he’s never been beaten and despite his trash talking he never underestimates an opponent because he knows that one hit in the ring can shift your whole game plan and cost you the match or in his case his undefeated legacy, so he trains as I said before daily and non stop constantly pushing himself for whatever opponent that comes his way because he knows he’s at a space where everyone wants to be and I believe the paranoia of knowing that everyone is after his spot and can take it if he makes one bad move is what keeps him at the tip top of the sport. 3. Tunnel Vision – Floyd is by far the most respected and hated figure in boxing, his bravado and flashiness doesn’t go well with a lot of people and they hate him passionately for it saying he’s destroying the sport of boxing etc. but even with all this hate being thrown at him from every angle he still manages to ALWAYS come out victorious. When Floyd walked in the arena for both his weight in and the actual match against Canelo he was greeted by a drowning sea of boo’s from the crowd, the absolutely hated him, they paid their money to see him lose. Floyd’s reaction to the hate is priceless, he just smiles and soaks it all in, knowing within himself that there is no way in hell he’s gonna let them get in his head, because he has tunnel vision and only focuses on the job ahead (knocking people out) which he does oh so well. 4. Know Your Worth – Floyd will definitely go down in history as one of the most business savvy boxer in history after going home with the largest purse in boxing history the other night ($41.5mil), he knows he’s a cash cow, he knows he embodies the sport of boxing, he knows gambling houses get millions in bets whenever his fights come around, he knows the seats fill up when he enters the ring because people pay to see him win and people pay to see him lose. HE KNOWS and because he knows, he’ll make sure he can get as much as he can from every business situation brought to the table and if you don’t wanna step up you can simply step aside. 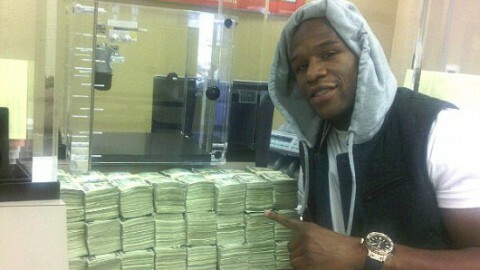 Is there anything else you learned from Money Mayweather? Let me know in the comments!